Posted 2/9/2015 2:35pm by Eugene Wyatt. A micron (a micrometer) is one millionth of a meter. Microns, expressed as Average Fiber Diameter (AFD), are how the wool of sheep is measured and valued. AFD's of fewer microns are always more dear. The Saxon Merino produces the most expensive wool per pound in the world. 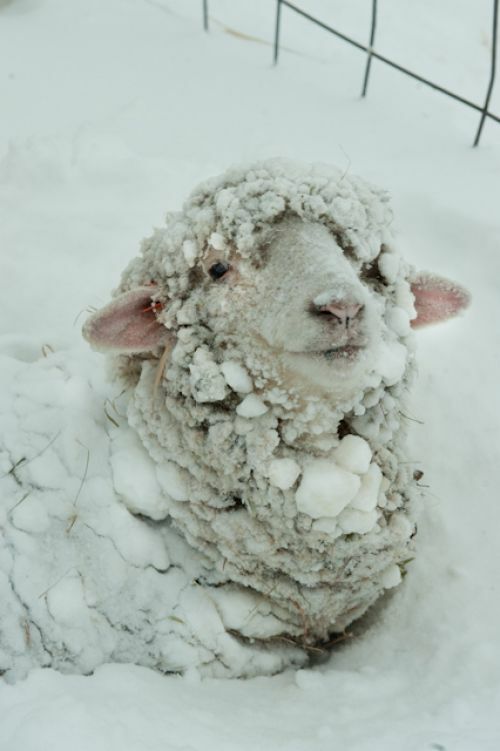 New York's climate—its annual rainfall—suits Saxon Merino sheep in the United States. I imported 5 world-class Saxon Merino rams for breeding from Australia in the early 1990's. Saxon Merino sheep are found exclusively in the higher rainfall country of southern Australia, especially in the highlands of Tasmania, the cooler and wetter regions of Victoria and the tablelands of New South Wales. Physically the smallest of the Merino types, cutting the lowest weight of wool (3-6 kg. ), the Saxon Merino is without peer in the quality of wool produced, e.g. a sheep producing 14 microns would cut 3 kilos and a sheep producing 17.5 microns up to 6 kilos. Specifically, this wool is extremely bright and white in colour, soft to handle and fine (i.e. narrow) in diameter. From the website of the Australian Association of Stud Merino Breeders. Strong—opposed to fine—wool prickles and makes the skin itch. Wool of an AFD over 30 microns has a Prickle Factor but wool of a finer AFD—below 16 microns—pills on wearing it; however these extremely fine wools are suitable for blending with other fibers. I wanted to be somewhere between the prick and the pill but I wanted the wool to be fine. In New York I breed Saxon Merino sheep with an AFD of 16 to 18 microns; this wool is superfine and soft to the touch but the fiber is broad enough to resist pilling on a garment. The AFD is determined by shearing a sample, 3" x 3" x the staple length of the wool, from the side of the sheep (see the ewes pictured) and sending the sample to a wool testing laboratory for laser examination. The ascending scale on the right hand side of the graph shows the number of fibers counted and the bottom horizontal scale shows the microns measured. The data on the graph reports that a Saxon Merino 10 month old lamb, eartag 14, has a 17.6 microns AFD. Sheep will have higher AFD's as they get older. The AFD is a selected average throughout the body of the sheep (the wool of the side is finer than the wool of the rump) and, as you can see, a true average throughout the sample tested. 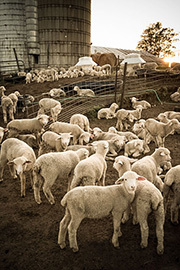 The samples were tested by the wool laboratory at Texas A&M in San Angelo, Texas.